From that question, you can probably guess that we are not rolling in the dough. We make a decent living, but we are teachers. And I just work part time. So we don’t get to go just because we have loads of cash sitting around. I must digress for a moment, though. We did buy a very modest home, and we drive used cars, and I make nearly all our food from scratch. We agreed a long time ago that we would rather live modestly and TRAVEL than have a fancy home and be stuck at home. So, behind our travel there is a family philosophy, if you will. 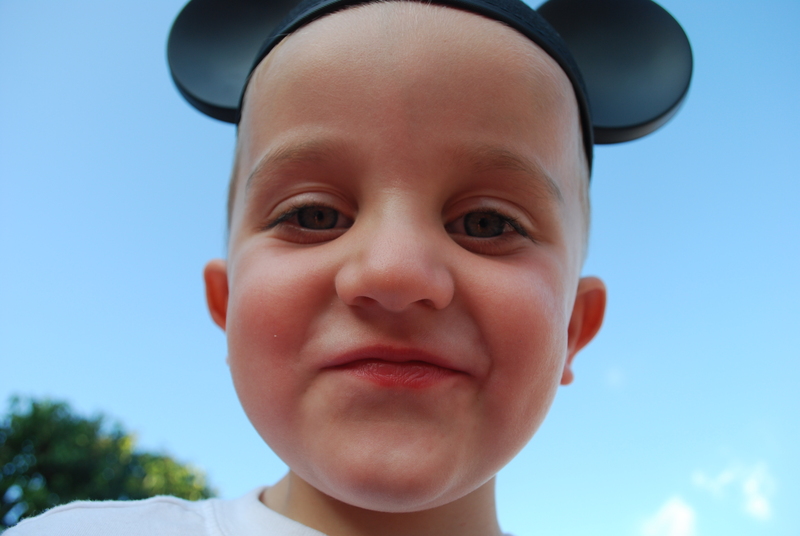 All this aside, a trip to Disneyland can be a stretch for us as it is most likely a stretch for most people. We have some techniques for making it more affordable and less stressful. Hopefully these tips are useful to you too! 1. Consider staying across the street from the park. After going to Disneyland numerous times, we have concluded that the only way to go is to stay directly across the street from the park. Specifically, the addresses of 1500-1600-1700 Harbour Blvd. are your best bets. Some of the hotels are the Del Sol, Ramada Maingate, Desert Inn & Suites, Anaheim Plaza Hotel, Castle Inn and Suites, etc. The 500s-600s on West Katella are not bad locations either, but always double check on the map. If the hotel is located on the other side of the park you will have to walk through Downtown Disney, which is not all bad, but farther from the park. The Disney website also has a list of “Good Neighbor” hotels on their website, and you can use a filter tool to find economy options. Note though that not all of the hotels across the street are “good neighbor” hotels and are generally less expensive. A. At the end of the day, after traipsing around the park, you will be tired. No, more like exhausted. If you have little ones, walking over a 1/2 mile to your hotel can be the longest and most miserable walk ever. I speak from experience. My youngest has seriously cried all the way from the park to our hotel. One time when we went we stayed about a mile from the park and that was simply too long to walk at the end of a busy day. Hateful, actually. 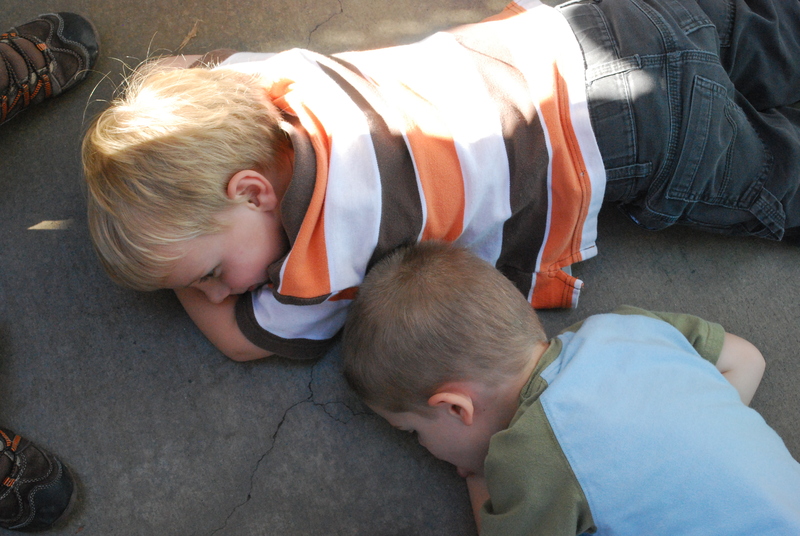 My nephews are feeling a little pooped. 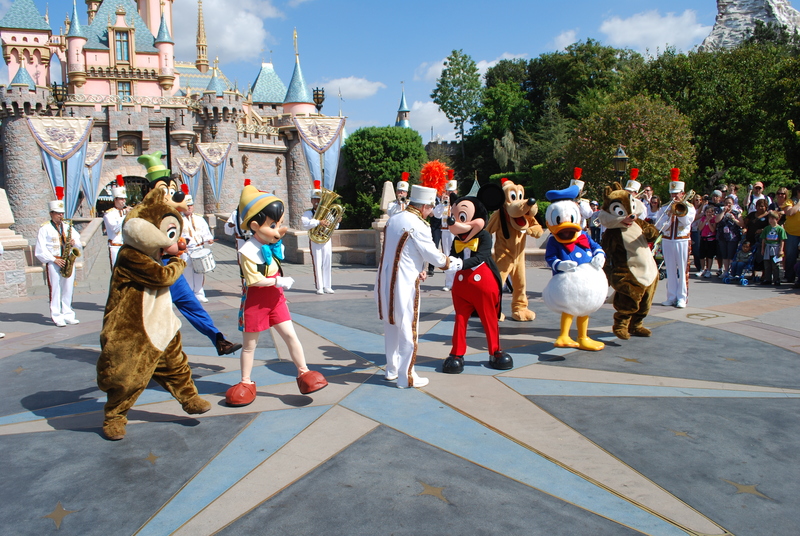 That happens at Disneyland. B. If you stay somewhere around the park, but more than a 1/2 mile, you can take the shuttle. But the Anaheim Resort Transit (ART) is not a free service and they have a daily charge per person. You can purchase bundle packages for multiple days but they are for consecutive days only, so if you like to go to the beach in between days at the park it does not work as well. For a family of six that can add up. Plus you have to wait for the shuttle to and from the park. And running back to the hotel because your forgot something or you want a pair of dry clothes or even if you want a nap costs more time and money. There are a few hotels in the area that provide complimentary shuttle service outside the ART system, so it never hurts to call and ask. But usually these hotels are more expensive. C. If you drive to the park, be prepared to pay $15 for the day and to sometimes wait up to one hour to complete the parking process. Then at the end of the day, you have to go wait for the parking tram. And it takes FOREVER. And if you have a stroller, you have to unload it and fold it up which is a hassle. It can take over an hour to get out of Disneyland at the end of the day if you have parked. D. If you plan on just going to Disneyland, and you have flown to Anaheim, staying across the street means you don’t have to rent a car. All you have to worry about is securing a ride to and from the airport, which is generally a lot cheaper than renting a car. 2. Shop around for hotel pricing, then call the hotel directly. Look around on Expedia, Kayak, and any other travel sites you find. Note the lowest prices. Then call the hotel directly. They will generally at least match the price, and sometimes beat it. You can even suggest that there are cheaper prices in the hotel next door. And many times, you don’t have to pre-pay like when you use the other services. Many of the hotels have a 48 hour cancellation policy. It always makes me nervous to pay ahead–what if something happens or we end up sick and have to cancel the trip? This way, you are not out the money. Even when using Hotels.com many hotels will allow cancellations, so just be sure to double check the policies for each hotel you investigate. 3. Make sure to ask if your hotel has the amenities you need. Remember, the amenities at these hotels are not really anything to write home about. But we have found there are some that make a difference for us. Call and talk to the hotel directly. A. Is the parking free? Many hotels in the Disneyland area charge an additional fee for parking your car or only have valet parking. This drives us crazy, since we usually drive. This would also happen if you had a rental car. But several of the hotels do NOT charge for parking or valet, and some will even let you keep the car in the lot after you check our for the remainder of the day. This is great if you are still spending the day in the park before heading out to a new location. B. Is there free WiFi? We often are needing to keep up with work issues, so a surcharge on WIFI is a pain, and some of the hotels charge quite a lot for this service. Many of the hotels in the area offer breakfast, and some do not. But let me warn you, unless you want to pay a lot more for your room, the breakfasts are not that great. Usually danishes, cereal, juice, milk, and maybe fruit. But it is at least something. Eating breakfast at the hotel saves you from eating yet another meal in the park, and also from the overpriced local places. An omelet at IHOP costs $13. Yikes! Even better, supplement the hotel breakfast by stopping at the grocery store and stocking the fridge in your room. D. Ask if there is a fridge in the room. Our tradition is to stop at Trader Joe’s on the way to the hotel. We get yogurt, bran muffins, fruit, and eggs that are already boiled. That way we can really tank up at breakfast and we have something for late night or after swimming snacks. E. Be sure to double check the location. Many of the hotels exaggerate how close they are to the park. They will say a “15 min walk,” but when your get there the walk they are referring to has you walking over an overpass or in areas without sidewalks. Or their “15 minutes” is only if you happen to be wearing roller skates. Use Google Maps to help as well. F. Is there a pool? If you are there off-season, when the park often closes early, my kids love to go for an after dinner dip, and that costs nothing extra! 4. Pack snacks and water into the park. 5. Use the Mousewait app or the Disneyland website before your visit to figure out the most affordable places to eat in the park. Some places are more affordable than others. The MouseWait app for Android or iPhone has a feature that will show you all of the menus for eating establishments in the park. Some of the less expensive places in the park are Rancho del Zocalo, Bengal BBQ, Jolly Holiday Bakery, and the Tomorrowland Terrance. We also really like the Paradise Garden Grill in California Adventure, where you can get Salads, Pasta, and Greek food for $9-11 a plate. 6. Split entrees or order kids’ meals. Unless you are traveling with teenage boys, there are several locations where the portions are big enough to split. For instance, Cafe Orleans is a more pricey location, but we always split entrees, like the famous Monte Cristo sandwich. I can’t imagine eating an entire sandwich. But, if you have teenage boys, you are out of luck. Seriously, last time we went my 14 year old, who is already over 6’4”, was having some kind of growth spurt, and ordered two entrees a couple of times. Oh well. Poor thing. He was just starving!!! If you have big eaters, you might want to consider some “all you care to eat” options like Big Thunder Ranch. It is pricier, but on the day you eat there you can get away with only eating one meal in the park by having “luchner.” Eating around three pm also helps you avoid lunch and dinner crowds. 7. Take your own camera into the park, or order a CD and split it with family and friends. There are official Disney photographers wandering everywhere, willing to take your picture. They use a very handy system where there is a card that can be digitally uploaded. Use the same card for the entire trip, and then when you get home, you order prints off their website. My husband is our official photographer, so he is often hauling around his nice camera. But I have had instances where we have split up and there have been opportunities I wanted to capture but couldn’t because I am too lazy to haul around my own very nice camera. So one time there was a character moment I just couldn’t pass up so I allowed a Disney photographer to take the picture. When I got home, I went to the site to order the prints, only to find out that prints are very expensive. If you don’t want to bother with taking your own pictures, instead of ordering print by print, order the CD. This is a fantastic option for large groups because you can all split the cost. 8. Plan a budget for your trip in advance and then do your best to stick to it. We have found that planning a budget helps us STAY reasonable and also to RELAX and not freak over expensive services and food. Even when eating cheap, it is expensive to eat out all of the time. For food we budget $10/person for lunch and $15/person for dinner. If we are feeling liquid, we add another $5 a day for incidentals. We have found that if we turn the cash over to the kids they can keep track of their own expenses and skimp if they want to save up for souvenirs. They can decide to ask for a water cup instead of buying a soda because they figure out they can’t afford it. I think that is much better than me being the bad guy. Knowing in advance that it is expensive there and planning for that is way less stressful for me than helplessly watching the expenses add up and fretting over the prices. My kids are 10 and up, so the cost is more, but if you have small children your budget can be way less. And as a side note, I would recommend NOT skipping out on the Disney dining experience. 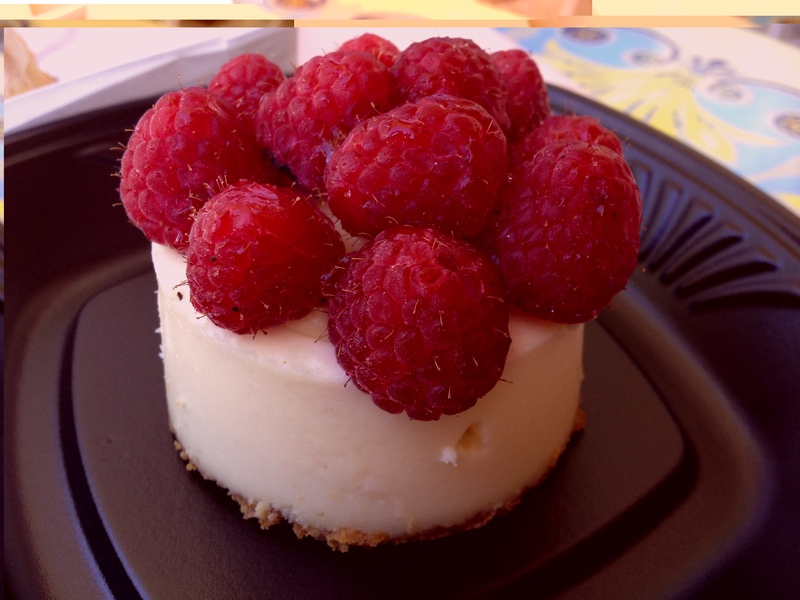 There is some food in the park that is truly delicious and if you are a “foodie” then this is just as good as the atmosphere and rides. I love taking a leisurely lunch with the entire family–you get to talk and enjoy each other’s company, rather than just running around like fiends. 9. Plan for different kinds of weather so you don’t end up making desperation purchases. Anaheim, like many areas of California, can experience extreme weather and drastic temperature fluctuations. After the sun goes down it can feel chilly, even in the summer. Always pack a hoodie or light jacket. One time when we were there in October we had the pleasure (lie) of 113 degree temps. We have also been at the park when there was practically a monsoon and it was very chilly. There were literally streams of water flooding down the walkways. The gift shops had long lines of people buying umbrellas, jackets, and ponchos. We now bring ponchos and umbrellas based if it looks like we might have inclement weather while we are there. 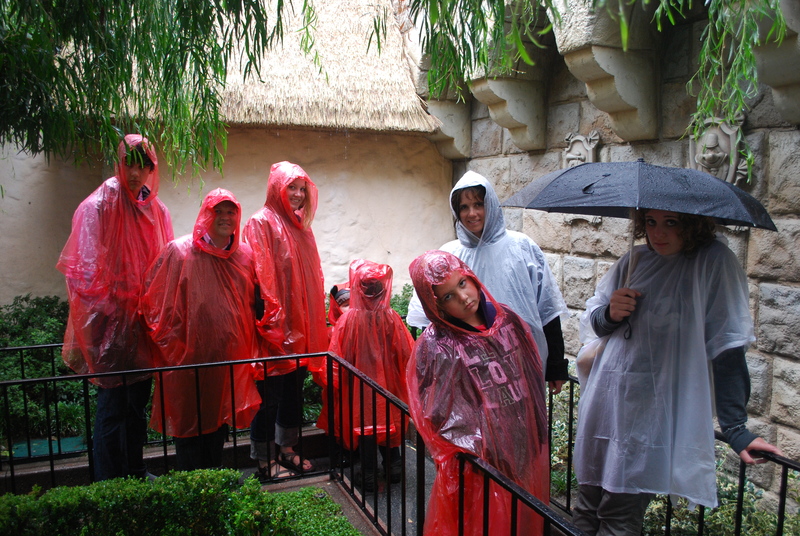 Purchasing umbrellas, hoodies, and ponchos for a family of 4-6 can cost several hundred dollars. But no one wants to spend one of their precious days stuck in a hotel room. Extremes in weather evacuate the park so it is awesome to be prepared so as to take advantage of the diminished crowds. 10. Consider purchasing a year pass. Even if you are only going to go to Disneyland twice in a year (for four days at a time), purchasing a year pass to Disneyland is cheaper than buying two four-day park hoppers. As long as you are putting out a lot of money, we prefer to just bite the bullet and buy year passes. We can’t afford that every year, but it is so fun for us, on the years we have passes, to know we have already paid for entrance to the park. All I have to do is live super frugally for a couple of months and I can accumulate enough cash for hotel and food. Plus, you get 10% off most food and purchases in the park, and that can add up as well. Some people have one member of their party purchase a premium pass and then just use that pass to take advantage of free parking and a 20% discount. If you love Disneyland, this may be the best option for you. Disneyland can be expensive but you are paying for detail and atmosphere, which makes it a major cut above other amusement parks. I would love to hear if you have any other tips. What do you do to make Disneyland affordable? Taking family vacations is a great way to bond and create memories. Nice write up on disneyland.its a place you never get tired of,its fun all the way.i like the way you plan for all members of the family,gonna try it next trip. Thanks! Yes, we have been pleased with the results of letting the kids moderate themselves. We spend less money and a few of them scrimp and save so they can get souvenirs. Less food is wasted too. Of course my youngest is 10…..I would imagine a child as young as 7 or so could manage their money, but it probably wouldn’t work as well for kids younger.